How fast did last week pass by?! Seemed to go like a flash for me! And speaking of time flying by, it seems to be getting colder and darker by the minute too! This weather calls for comfort food! 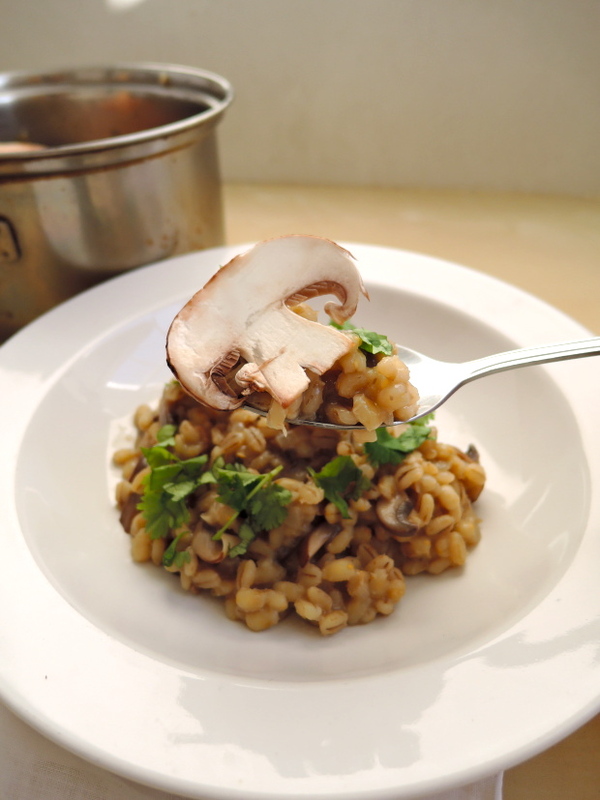 This risotto is super creamy and warming and there’s a lovely depth of flavour from the porcini mushrooms! 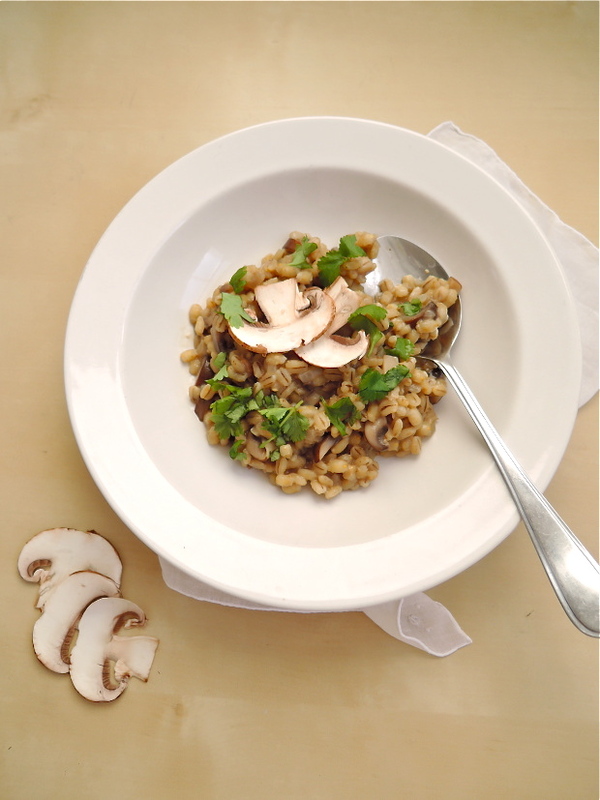 This is a thrifty and delicious alternative to risotto – it still has great bold flavours, but is also much lighter as there is no dairy in sight! However, you are welcome to top with cheese or stir in some butter at the end for extra decadence! Sauté the onions until soft in a pan of olive oil then add the garlic. 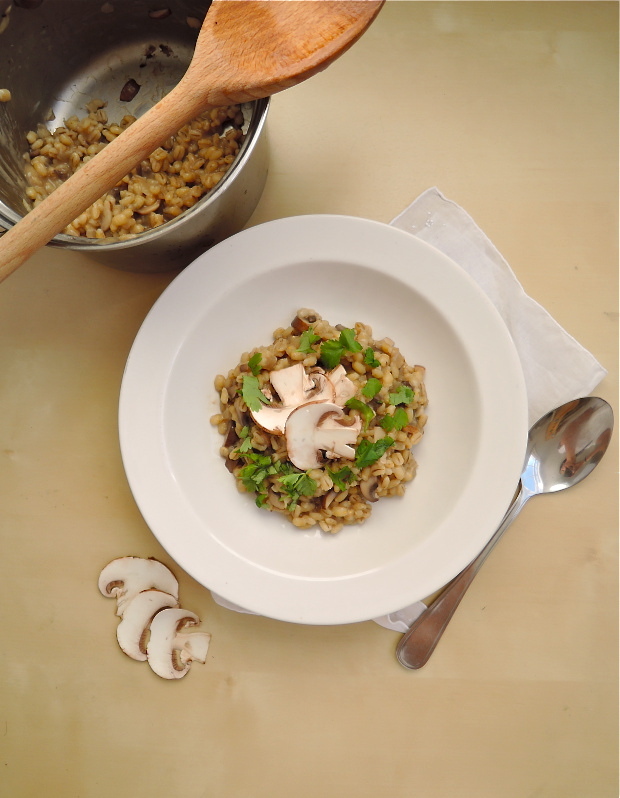 Once onions and garlic are fragrant, add the pearl barley and stir around the pan until coated in the flavours. Slowly add the stock – 1 ladle at a time for about 15 minutes, mixing constantly. When halfway through the cooking process, add the chestnut and porcini mushrooms and the porcini ‘stock’. Keep stirring and gradually add stock for another 20-25 minutes until barley is cooked but slightly al dente. Serve with a garnishing of parsley and raw mushrooms (you can also sauté some mushrooms in a dry pan). I’ve never seen pearl barley used except in soups. I can’t wait to try this! 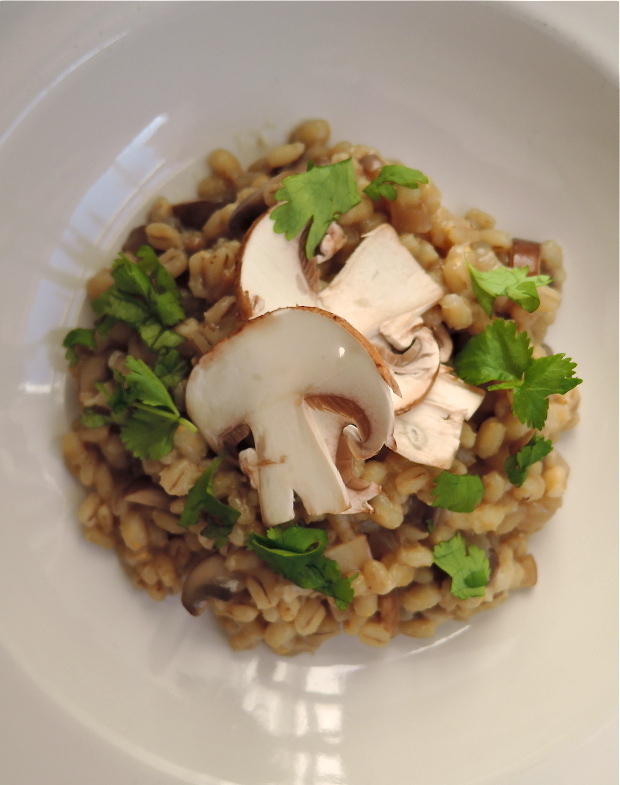 Thank you Ana – it gives a lovely texture and a nutty flavour which goes perfectly with mushrooms! This looks so delicious! I love risotto so much! 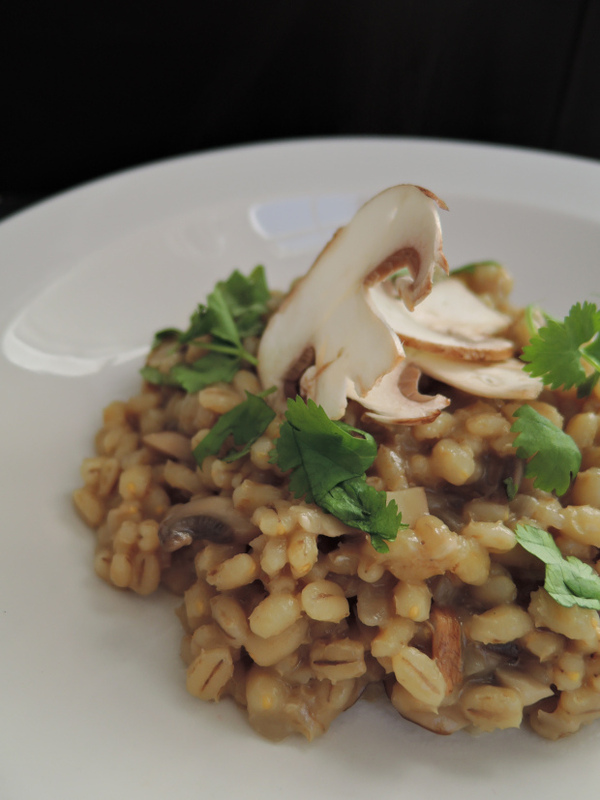 Great idea to use pearl barley instead of arborio rice! I love using wine in my risotto too. Lovely dish. Thanks you! 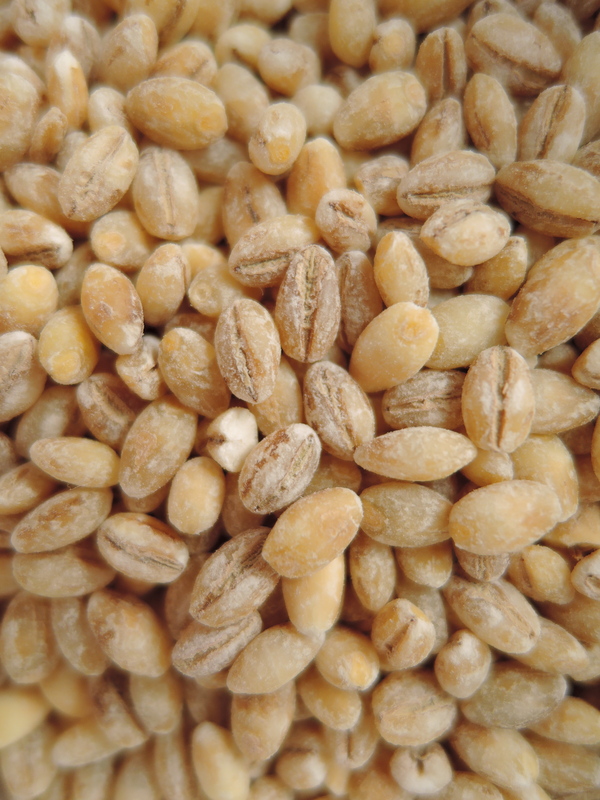 Pearl barley is such a great cheap alternative and tastes just as good! I agree. Actually, this entire month seemed like it went by in a flash. How is November almost over?? I have never made risotto, but I really want to now! This was my first time making it an really wasn’t as hard as it seemed! Wow what a coincidence, just bought pearl barley to make lemon barley water today and I was wondering what I’d do with the rest of the packet….also, I wanted to make mushroom risotto for dinner tomorrow – and then I chanced upon this! A great combination of both!!! I’ll give this a try for dinner tomorrow!! Love that up close shot of the barley!! SO yummy. Thanks Shikha – glad you enjoyed the recipe!